This post takes all the data from the previous posts in this series and combines them into one graph. 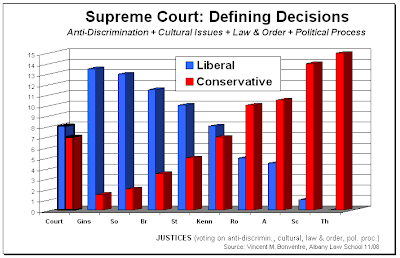 All the "defining decisions" from the Supreme Court's last term--the rulings and the votes in selected cases involving discrimination claims, "cultural issues," law & order, and the political process--are recapped in a single graph that depicts the justices' respective positions on the Court's ideological spectrum. Not surprisingly, that spectrum is wide and clear. That is, at least with regard to which justices' voting records place them at the ends of the spectrum, and which fall closer to the Court's center. OK, so what's clear? Some things are clear simply by looking at the graph. Some by also recalling the graphs and a bit of the discussion in the previous posts. First, as for the Court as a whole, the record is quite balanced between liberal and conservative decisions. That might be unexpected. But the explanation here is the Court's record in the discrimination cases included in the "defining decisions." The Court rendered "liberal" decisions--i.e., it sided with the party complaining about race or age discrimination--in every one of those cases. That tempered the Court's otherwise fairly conservative record. Second, both ends of the Court's ideological spectrum are unmistakable. At one end, Ginsburg and Souter both have strongly liberal voting records--almost perfectly so--in each of the four categories of cases. Ditto for Thomas and Scalia at the conservative end. Third, Breyer and Stevens have voting records which place them firmly on the liberal side of the Court, but not quite at the far end with Ginsburg and Souter. Breyer broke with the liberals several times on law and order, as well as in one political process case. Stevens broke with the liberals even more frequently on law and order, as well in the cultural issues cases. Fourth, Roberts and Alito are firmly within the Court's conservative wing. Both of them, however, sided with the liberals in every discrimination case, and Roberts did likewise on some law and order issues. Fifth, Kennedy in the middle. He was with the liberals in every discrimination case. His votes were evenly split on the cultural issues. His record on law and order leans conservative, and on political process issues even more so. There you go. A neat little nutshell. It's not all there, of course. That would take a lot more than a few brief posts (ok, not always so brief) and graphs (however "nifty" and telling). But it certainly gives a bird's eye view. That our Court. That's what we've got. Let's see if Obama's election precipitates some retirements. And then all the fascination and fun of speculating about his possible appointees and of watching the nomination hearings and other developments. Great stuff for Court junkies. And extremely important stuff for all of us.